It is estimated that more than 1 million tonnes of textiles are thrown away every year, with most of this coming from household sources. Textiles make up about 3% by weight of a household bin. At least 50% of the textiles we throw away are recyclable, however the proportion of textile wastes reused or recycled annually in the UK is only around 25%. Buy higher quality, longer lasting clothes. They will save you money in the long run and reduce waste. Buy your clothes second hand from charity shops, you can often find some unusual items whilst donating to charity at the same time. Look for recycled content. Donate any unwanted items to charity shops or jumble sales. There are many ways to customise or use old clothes and fabrics to make new ones. For ideas on how to get started have a look in your local library for books or the internet at sites like Burda Style, where you can download free patterns and step-by-step tutorials that show you how to make new clothes out of old or customise existing clothes. Please do not put your textiles in your clear sacks, green bins or communal recycling banks. They cannot be recycled this way. 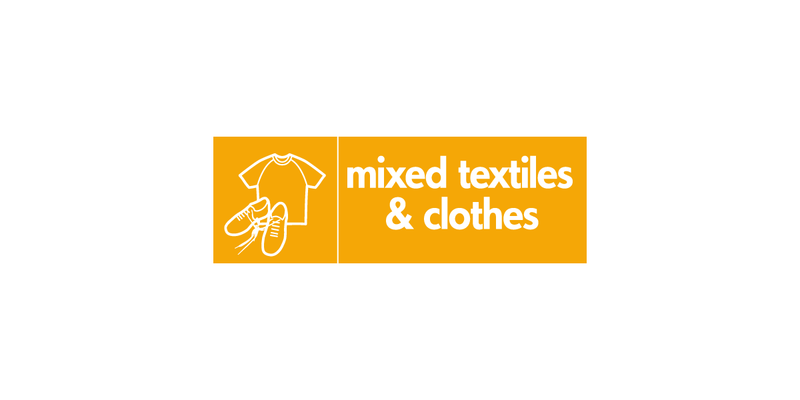 You can also recycle or reuse unwanted textiles at the Smugglers Way Household Waste and Recycling Centre. All textiles and fabrics but they should be clean and dry. pair of shoes, pair of boots, belts, hats and handbags (all shoes should be placed in pairs and secured together using an elastic band or string. Quilted bedding, duvets, sleeping bags, soft bags, cushions, upholstered furniture, pillows, beanbags, large volumes of heavy blankets, wellington boots, offcuts from manufacturing process and unfinished garments.